One of my favorite dinners growing up was taco night. My mom laid out all the fixin’s on the table and we would race to make our own taco creations. Mine were always fully loaded with shredded lettuce, beef and cheese. As a kid, it’s a blast to make your own taco. Now, as an adult (ehem – young lady – ehem), I’m bringing back taco night…. this time, with zucchini spaghetti! Let’s be real. Tacos aren’t exactly something you want to throw back when you’re going down the shore (sorry, can’t hide my Jersey roots) during the summer and want to look your best on Instagram. They’re packed with all the hip-clinging stuff – meat, cheese, carbs. But, a-ha! 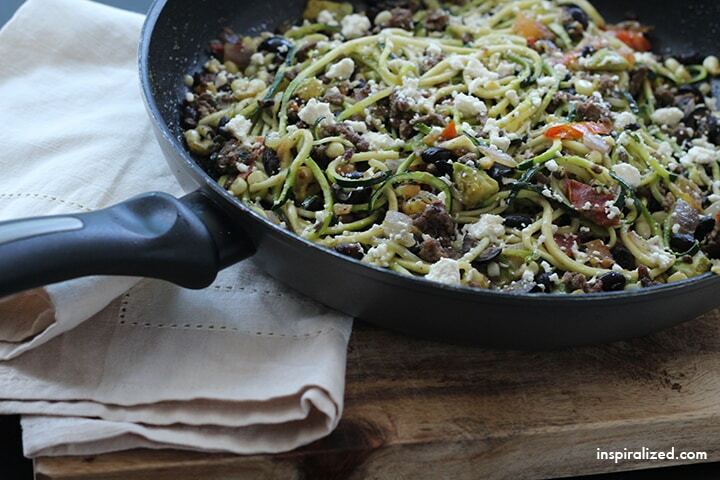 I’ve got the perrrrrfect solution: replace the tortillas/taco shells with zucchini pasta!